What can I say friends? I saw an opportunity and I had to take it. I modeled this crochet bucket hat after my sons other hats and I’m pretty darn pleased with how they turned out! This was not only an opportunity to play with the Red Heart Super Saver Stripes, which I really REALLY love, but also an opportunity to save myself a bit of money. Unfortunately, my store only had a couple of skeins left, obviously a popular choice around here, but I will definitely be grabbing a few more RHSS Stripes as soon as they’re available! I, Colleen Hays, owner of YarnWars.com, created this pattern to be offered free to my yarn crafting friends near and far. This includes anyone with a passion for yarn in whatever medium, crochet, knit, loom and more. Whatever you wish to do, be it sell or gift your final workup of this pattern, you are welcome to do so, I just ask that you give a small credit in some way to YarnWars for the design. Please do not distribute copies of this pattern instead, please refer others to YarnWars.com website to pick up their own free copy. Referring others to my website is what enables me to continue creating free patterns for the community and offering venues for yarn-tistas to come together. Thank you so much for your interest in my pattern and appreciation for the terms laid out. Inc – Increase: Working 2 stitches within 1 stitch. Begin by creating a magic circle OR chain 4 and join with 1st chain made to form a loop. Ch 2, work 10 hdc into circle/loop. After round 8, you’ve completed the adult size crown for your hat which should measure approximately 7”. Ch 2, repeat round 9 once more. Rounds 11-18 should measure approx. 3”. Measuring from front loop ridge in rd 10 to end of round 18 at beginning of start of brim of hat. If you wish to add to the length of the hat, simply repeat previous round until you reach desired length. I finished both of my hats with a slip stitch in ea st around to end. This is optional, you can leave it as it and finish off by hiding tails at this point. Your hat is complete! I really hope you have enjoyed working up my version of the bucket hat, it is simple, quick and you can get insanely creative and colorful with it. I am also really enjoying these Red Heart Super Saver Stripe colors, I’m sure you could have just as much fun with the Bernat Stripes or switch it up and join new colors to your liking! Use the chart below to adjust accordingly to the size you need. For teen – adult small with a circumference of 20″, eliminate 1 round of hdc from the crown section of the pattern before you begin working down the side of hat with (b2lo). This means the crown of your hat should have 70 stitches from end of crown to start of brim instead of the 80 stitches ended with the adult medium size of 21-22″ worked in the pattern above. You will continue working the brim from where you left off on increases on the crown, which will be 1 hdc in each of the 1st 6 st, beginning with the starting ch sp, followed with an inc of 2 hdc. You will complete the hat in the exact same fashion as the printed adult pattern only with the adjustment in your stitch count. That is the ONLY thing you should have to do different, this hat is so simple to alter for size. The same would hold true for a smaller or even larger size hat. Again, check the hat sizing chart below to help you with adjustments for whatever size you are making. Please note: The chart below shows approximate sizing as each new round of hdc adds approximately 1” to the crown. This will be different working down the length of hat where each new round of hdc adds approximately .5”. This is not a typical hat that will hug snugly around all areas of head so make sure to adjust accordingly to tension as well. Take your tape measure, wrap around the head over forehead area around total head. In the example below you see the measurement is just below 20”, so we will round up our sizing since we are closer to 20” than 19”. Take your 20” measurement and multiply that by (pi) 3.14 which gives us 6.36 for our diameter, so we will round that down to 6”. This means we want for the diameter of our hat to be approximately 6”. The photo below shows how you will measure to find your diameter of 6” (The photo shows different size- ignore that.) This is our crown diameter measurement. This means we will be working a Teen/Adult Small hat. I hope you have enjoyed making this crochet bucket hat! Bet you can’t make just 1! I’ve made 4 already just because it is so quick and such a great no nonsense movie project; I wouldn’t doubt an awesome craft fair seller as well! Like us on our YarnWars Facebook Page and comment in the Bucket hat post with the picture of your work up, and / or, join us in the YarnWars Group and show off some of your awesome makes! Subscribe to my YouTube channel if you prefer video tutorials. You will be the first to know when a new YarnWars pattern video is released. 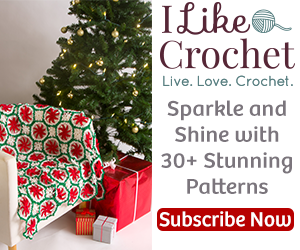 I like to create a video for each of my patterns, so even if you get stuck in the written pattern, you will have a video to refer to! Have a perfectly wonderful day my friends!